There is nothing more indulgent than a traditional English scone, with jam and fresh cream, for tea. Plain and fruit scones can easily be made in sugar free versions, and of course there are all sorts of toppings you can create too. Whether you tuck into your scones straight from the oven when they are warm in the winter or enjoy one or two during a light tea in the garden in summer, they make a tasty, sugar free, sweet treat to really relish. These tasty plain scones become particularly tempting when topped with rich clotted cream and sugar free strawberry jam. 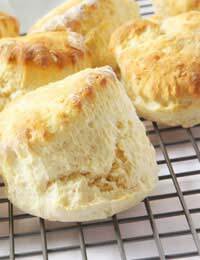 This sugar free recipe calls for a granulated sweetener in the scone mixture. Remember to ensure it is suitable for baking with. Preheat your oven to 180 deg C/350 deg F/gas mark four. Place your dry ingredients in a bowl then rub in your butter. Stir in your milk until you have made a good dough. Grease a baking sheet. Lightly flour a surface then roll out your dough to about three-quarters of an inch thick. With a scone cutter of the desired size, cut out shapes. Place on the sheet and brush with a little milk. Bake for up to 20 minutes until golden brown. Eat warm or cold with lashings of sugar free strawberry jam and clotted cream. These fruit scones are delicious when served warm. Slice in half and spread on some butter. Eat as the butter melts and before the scones cool. Preheat your oven to 180 deg C/350 deg F/gas mark four. Place your flour, sweetener and salt in a bowl then rub in your butter. Stir in your milk and add your sultanas. Make into a ball of dough. Grease a baking sheet. Lightly flour a surface then roll out your dough to about three-quarters of an inch thick. With a scone cutter of the desired size cut out shapes. Place on the sheet and brush with a little milk. Bake for up to 20 minutes until golden brown. For other delicious sugar free toppings try using fresh fruit and whipped cream. With plain scones, for example, take a couple of handfuls of fresh strawberries or blueberries. Wash and prepare the fruit, slice strawberries in half. Whip up one portion of your fruit with your cream and spread in the middle of your scone. Then use the rest of your cream as topping, and decorate with your leftover fruit. Make your own cheesecake flavour scone toppings and fillings by using sugar free jam and cream cheese. Cut your plain scones open and spread with sugar free blackcurrant jam, then cream cheese. Replace the top of the scone then add another helping of each spread.